The following article was co-written by MiningWatch Canada and Network in Solidarity with the People of Guatemala (NISGUA) with support from former NISGUA staff, Ellen Moore. Tahoe Resources is lobbying U.S. and Canadian authorities to intervene on their behalf following a decision made by Guatemala’s Supreme Court in July to temporarily suspend operations at the company’s Escobal silver mine. The decision cites discrimination and lack of prior consultation of Indigenous Xinka communities, whose ancestral territory is impacted by the project, located in southeastern Guatemala. The country’s Constitutional Court confirmed the suspension last week in response to an appeal filed by the company’s Guatemalan subsidiary. Arguments to determine a final decision in the case were heard in the Supreme Court on August 28. In a public letter to the U.S. Embassy in Guatemala dated August 23, 2017, Tahoe Resources accused the Constitutional Court of “potential judicial impropriety,” alleging that the judges involved in last week’s decision were manipulated. In the letter, Tahoe Resources also reiterated stigmatizing rhetoric against people from six municipalities who, since June, have been peacefully demonstrating against its project in the municipality of Casillas over the current and future impacts of the mine. 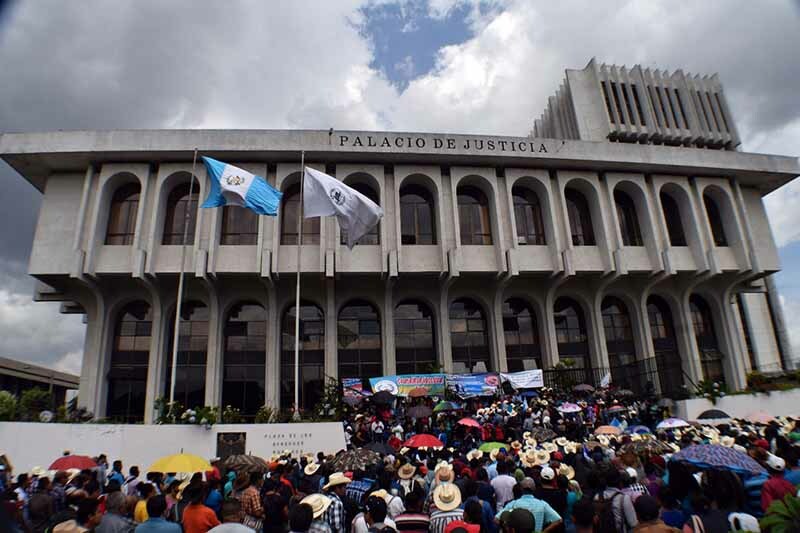 The company’s unsubstantiated accusations against the country’s highest court are concerning as Guatemala entered into another political crisis last week, with justice officials under attack. On August 25, the UN-backed anti-corruption unit CICIG and the Guatemalan Attorney General’s Office requested the court strip President Jimmy Morales of his presidential immunity in order to proceed with charges linked to illegal funding of his 2015 presidential campaign. Two days later, Morales announced the expulsion of the United Nations official commissioned to lead CICIG, Iván Velásquez of Colombia, declaring him a persona non-grata. Within hours, a Constitutional Court decision reversed the action. Nine countries with diplomatic presence in Guatemala, including Canada and the U.S., released a statement in support of Velásquez and the CICIG. Tahoe’s lobbying efforts began in July according to a follow-up letter from Tahoe to the Deputy Assistant Secretary at the U.S. State Department. Tahoe has also enlisted support from Nevada Republican Senator Dean Heller and Republican Congressman Mark Amodei, who wrote letters to the Secretaries of State and Commerce respectively. In both letters, the representatives allege politically motivated attacks on Tahoe’s operations in Guatemala and warn of economic and political instability, and damage to US relations with Latin America if the court decision is allowed to stand. Both urge the Trump Administration to intervene to protect U.S. interests in Guatemala. The Canadian lobby registry shows that Tahoe has also been very active lobbying Canadian public officials since its mine licenses were suspended in July. While records are still not available for August and are generally short on details, Tahoe lobbyists met with the Director General of Trade Commission Services, policy advisors from the office of the Minister of International Trade, the chairs of the Standing Committee on Foreign Affairs and International Development and the Standing Committee on Natural Resources, the Parliamentary Secretary to the Minister of Foreign Affairs, and the office of the Extractive Sector Corporate Social Responsibility Counsellor. While few details are known about the content of these meetings, the company’s strategy may be illuminated in a recent article featuring Representative Amodei, who suggests that the mine’s permanent closure could lead to a rise in drug trafficking and crime in the region. In his appeal to fear, Amodei fails to acknowledge that Tahoe’s arrival to the region in 2010 has led to destabilization, and that residents who oppose the company’s operations have faced a counterinsurgency strategy marked by criminalization of dissent, repression, and targeted violence. The argument that without the Escobal mine, residents of Santa Rosa and Jalapa will have no choice but to turn to a life of crime “to make ends meet,” is not only false and paternalistic, but an affront to the dignity of local residents in this largely agricultural area. In its August 23 letter to the U.S. Embassy, Tahoe also continued to misrepresent a local protest in the municipality of Casillas as “an illegal road blockade”, claiming that the “government has not been successful in enforcing rule of law in the area and today the blockade continues.” Since early June, residents from six municipalities in the area of the Escobal mine have maintained a peaceful assembly on private property from which they have been selectively turning back mine-related traffic. Before the Supreme Court suspended two of the company’s licenses, work at the mine has stopped as a result of this demonstration. In late June, police cracked down on the protest using tear gas, but were unsuccessful in intimidating local residents who resumed their action with thousands of people coming out to participate just hours after the repression. Again, in late July, members of the national police attacked the 15 or 20 men, women, and children present at the peaceful encampment in Casillas at about 2:00 a.m. Community members have questioned the legality of the attempted eviction and have reported that four people were poisoned by pepper spray and that three others beaten by police had to be hospitalized. During the last two months, Tahoe Resources’ suppliers, workers, and the Guatemalan Industrial Association have also engaged in a smear campaign in the Guatemalan press against the Center for Environmental, Social, and Legal Action (CALAS) and its supporters for having brought the claim against the Ministry of Energy and Mines that led to the Supreme Court decision. During its arguments before the Supreme Court on August 28, legal counsel for Tahoe’s wholly owned subsidiary, Minera San Rafael, once again denied the presence of Xinka communities in the immediate area of influence of the Escobal mine. She claimed that the Environmental Impact Evaluation approved by the Ministry of Energy and Mines, which used data from a 15-year old census and the notoriously exclusionary national birth registry, was sufficient to determine the presence of the indigenous people according to national and international law. Mr. Arana’s legal representative Quelvin Jiménez, also a member of the Xinka people, asked the court to consider that their decision is not just about the right to consultation, but also the right to indigenous self-identification. “It is a shame that the Ministry of Energy and Mines, in order to protect the interests of a multinational company, says that the Xinka people don’t exist. If it is true that we don’t wear traditional clothing that identifies us or that we have almost lost our language, then it is also true that the most important element of our ethnic identify is our territory… Today, there is more at play than the simple right of the Xinka people to consultation. This is about the right to self-determination recognized by the declaration of the United Nations on indigenous peoples…You have the obligation to uphold the values and principles of the constitution which recognizes and guarantees the right to life which is intimately tied to the right to consultation, a daily practice that we carry out as Xinka people,” stated Jiménez. In response to the company’s lobby and with profound concern about the potential for greater repression and criminalization while the mine remains suspended, forty Canadian and U.S. organizations sent a letter last week to both the US and Canadian Embassies. The letter calls on Canadian and U.S. authorities to insist that due process be followed in the Supreme Court case and not to intervene on Tahoe Resources’ behalf with Guatemalan authorities. It further calls for the Embassies to denounce the smear campaign against activists and to, publicly and through diplomatic channels, demonstrate support for the legitimacy and importance of the efforts of the organizations, indigenous and non-indigenous communities, and individuals who are peacefully defending their wellbeing and safe living environment from the harms being felt from Tahoe Resources’ Escobal mine.